CAMINO-701 seems to have difficulty working with specific older NMEA0183 devices like e.g. Furuno heading sensor. What to do? Certain older NMEA0183 devices use data sentences which are no more supplied by modern marine electronics and cause incompatibility with CAMINO-701. To solve the incompatibility issue, these data sentences are added to CAMINO-701´s firmware V1.0.6.38. We strongly encourage users always to apply the latest firmware for CAMINO-701 which is available for download at our website. It may fix known bugs and contain other improvements. Why can´t I see my vessel on online AIS site such as www.marinetraffic.com? Many web-based AIS services of this kind operate with AIS data received by hundreds of volunteer-operated AIS receivers around the world. Since the system is not formally organized but instead relies on anyone who decides to upload data to the service provider, your vessel must be within the reception range in order to be seen on the online AIS service. CAMINO-701 receives AIS targets normally, but no one in the surrounding can see my vessel, why? Check if your class A transponder is transmitting at all or if it is set to low power mode. Find the related settings in the submenu “Transceiver” and make sure that correct channels and power mode are used: in the regional list channels can be configured manually. Another promise to enable the transmission is the setting of MMSI number. If the MMSI is not set, the CAMINO-701 will be silent. Can an antenna splitter be used for CAMINO-701? According to IMO regulations, an AIS class A transponder must be connected to its own VHF antenna. Sharing of a VHF antenna with other devices is not allowed. What to do when an alarm is generated that antenna VSWR exceeds limit? CAMINO-701 is checking the VSWR (Voltage Standing Wave Radio) of the antenna by every transmission and will raise an alarm when VSWR exceeds its limit. Usually the VSWR alarm appears, when the connected VHF antenna is not performing well. That could be the result of a defective or loose connector and damaged cable. The alarm may also be triggered when the VHF antenna is installed close to a metal pole or parallel to another VHF antenna. It is important to follow the instructions for an antenna installation as thorough as possible. Section 3.4 in your user manual describes how to install the VHF antenna in the correct way. What is the range of CAMINO-701? As a rule of thumb, the VHF range is equal to the line of sight from the antenna position. That means, the higher the antenna is installed, the longer the range will be, provided that the class A transponder is connected to an approved, well maintained and correctly installed antenna. Nevertheless, there are still factors that are not under control of any installer, such as weather, geographical and sea conditions. My CAMINO-701 AIS display is showing “FIRMWARE UPGRADE”, what to do? This is a hardware error and requires service dealer correction. Please contact your local AMEC service dealer who will fix the issue for you. How to display AIS Targets on your Macintosh via OpenCPN? 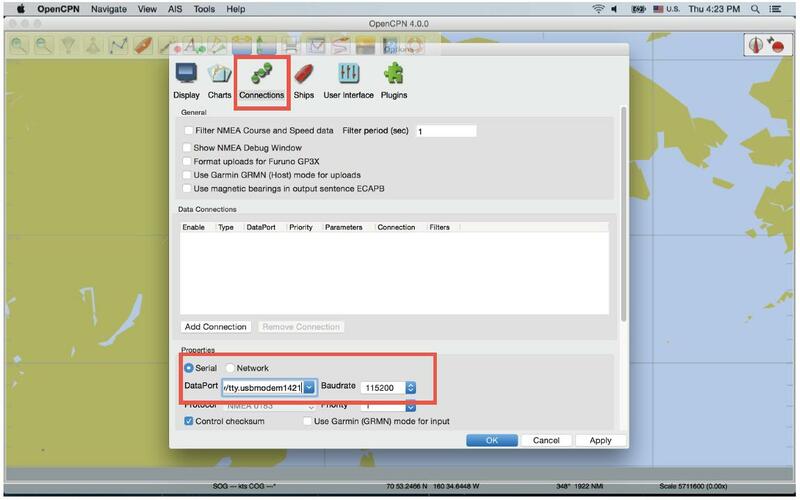 Launch OpenCPN and go to Preferences. In the Preferences page go to Connections.